Incredible receiver for the money. This is the same as the RXV640. Even in 2018, this is still my "daily driver," despite having a more modern unit in my movie room. As expected, the DSP modes work great and decoding of PCM, Dolby Digital, and DTS work flawlessly. Audio is crisp and clear, and the DSP modes truly add dimension to multichannel audio and don't fatique the ears. A few notes: -Signal processing, like Dolby Pro Logic II, only work on source material up to 24bit/48kHz - 96kHz only works with stereo. Set this up properly if you're connecting to your computer. -Does not decode the latest HD formats. -Subwoofer crossover frequency is fixed at 80Hz, so choose your speakers wisely. Highly recommended - I'm keeping mine forever. Nice design, front inputs( you get a front fiber optical) display. preamp outs. 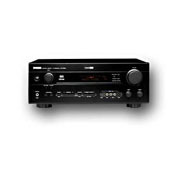 I workat best best buy and have tried all of yamaha's low-medium revievers and must say that the 5660 is a great deal. I wanted to get the 5590 but i could only blow one paycheck so that was out of the question. Its an upgraded 5560 and for the price(I paid wholesale) it cant be beat. The entire yamaha line is incredible. We only use yamaha's topower our speaker displays, granted we donthave that many. :) But even the old 5240's sound great with the klipsch SF 2's. The power is clean att all volume levels, even the dsp's arent that bad. The # of inputs that you get combined with 6.1 discreat is great. distortion is 0.06% at 85watts wich isnt bad. although you will get 720 watts total if you really crank it.